Question of the Week – What’s your current favorite lip balm? Answer: – I use Lanolips 101 Ointment nightly (well, not every night at the moment ‘cos my lips are ok… but definitely 2-3x a week, more in the winter) and Homeoplasmine before I put a drying lipstick on in the day. With these two working together BEAUTIFULLY, I never need to carry a balm around with me. Gouldylox Reviews – Scared to try hair and face oils for fear of being oily? Don’t be! Here’s a guide to my favorite oils! 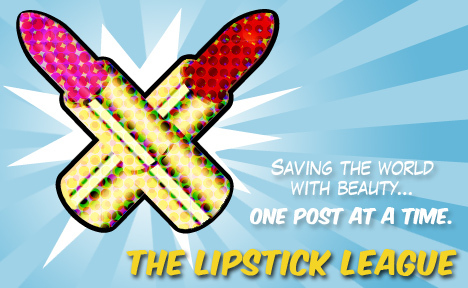 Lipglossiping – blames it on everything but the boogie when she reviews the Limited Edition The Rich is Back! kit from Benefit. My Beauty Bunny – Beauty bloggers are buzzing about the latest science-based treatment from FutureDerm. Here’s your chance to instantly win a deluxe sample of their game-changing, skin-saving Vitamin CE Caffeic Serum! Nouveau Cheap – Did ya hear that those fab Wet n Wild 8-pan palettes from Spring 2013 have been re-released? Yep, you’ve got a second chance to grab ‘em. Pink Sith – received the newest CHANEL Gri-Gri eyeshadow as a gift from a loverly blogger friend. Therefore she shall spare her life and not consume her still beating heart in front of her because that’s what friends do for each other. Prime Beauty – is revved up and ready to put the pedal to the metal with the new bareMinerals Power Neutrals Collection! Phyrra – gives you 22 New Reasons to Fall in Love With Urban Decay Revolution Lipsticks. Vampy Varnish – Loves the new Urban Decay Revolution Lipsticks and is positive you will find many you love as well! we heart this – brings you a bevy of bronzing beauties from bareMinerals, babe!